These mistakes are mine. 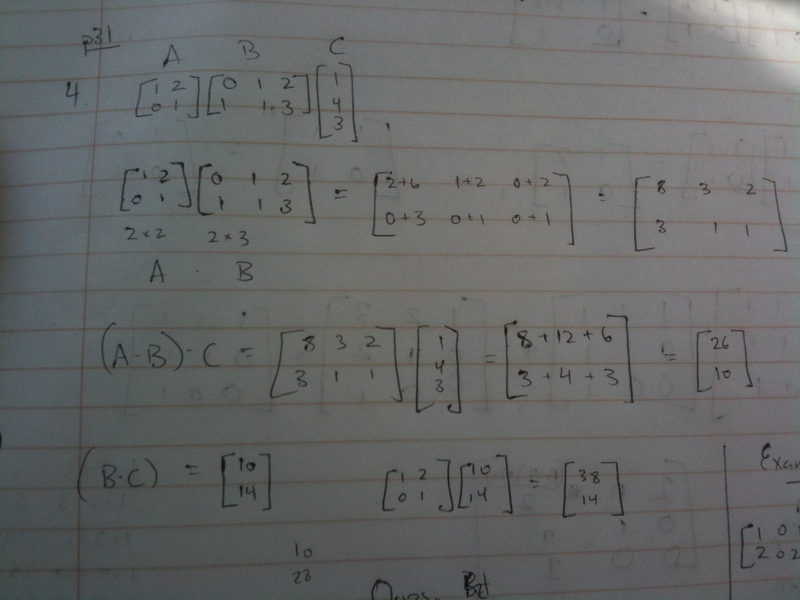 I was tasked with checking the associative property with matrix multiplication, i.e. checking that (AB)C = A(BC). This was my first attempt. See the problem? By my estimation, this is a fairly straightforward mistake. I was explicitly trying to remember a routine, and I remembered the wrong one. 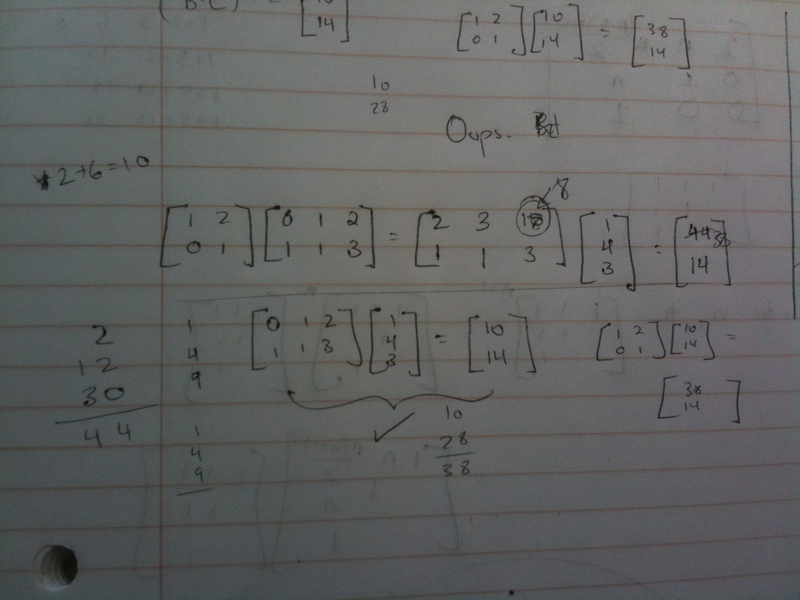 I don’t have any particularly deep appreciation for how matrix multiplication works, so there was nothing except memory of the routine for me to draw on. I made a mistake that I’d characterize as a working-memory issue. Do you see it below? I even circled it. Well, what about the particular working memory mistake that I made? In my calculations I put a “10” where an “8” ought to be. In my mind, I was attempting 1*2 + 2*3. Why did I come up with 10 instead of 8? Was it mere chance? Could I just as easily have come up with 7, or 23? I have a pet theory, one that I have no clue how to prove. I believe that there are certain numbers that we remember as being especially connected. To our minds, I’d suggest, the numbers 100 and 1/2 are especially connected with 50 — and not with 99.5, 200 or 100.5. Certain numbers are clustered with others, with varying degrees of strength, and in various moments our responses can reveal these deep connections between the numbers themselves. Of course, I have no evidence for this pet theory. I’m not sure how to test it, though I’m wondering if some variant of what I tried with my friend last week might be workable. Posted in Matrices, Vector and Matrix Quantities.